Joseph Paris Naturally - Why do you bleach the knots in human hair hairpieces? Our hair systems are available in both human hair and synthetic fiber. Human hair may offer superior feel to the touch, but it does have its drawbacks as well. If you've seen handmade wigs before, you'll notice that the knots of the darker strands of hair where it is sewn into the foundation create a noticeable dot that can look unnatural when viewed close up. yourHAIRx has developed a special method of bleaching just the very base of each strand of hair where it is sewn into the transparent foundation material so that the knots become virtually invisible. While some hairpiece companies claim they can offered bleached knots in their wigs, the result consistently pales in comparison to our product. 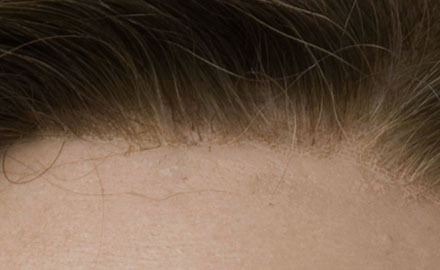 Unbleached knots in darker human hair become noticeable when viewed up close. 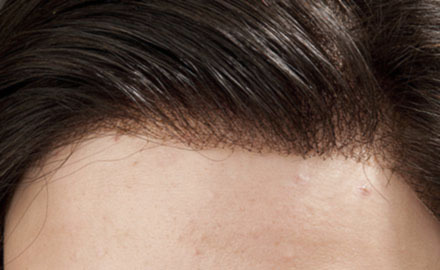 With our special knot bleaching technique, the knots in darker human hair virtually disappear, and the hair appears to be growing right from your scalp.